Perungudi dump yard chokes the Pallikaranai marshland. The city has two dumping grounds spread across 400 plus acres in Kodungaiyur and Perungudi, both of which have been in existence for over 25 years. These dump yards handle anywhere between 2100 and 2400 metric tonnes of garbage on a daily basis. 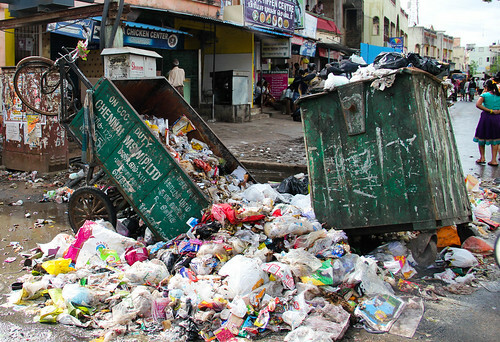 According to the Corporation of Greater Chennai’s solid waste management (SWM) department, nearly 4500 metric tonnes of garbage is collected from across the city daily. Perfectly compostable food and green waste constitute nearly 40 percent of this. The city corporation picked October 2 this year to make source segregation of garbage mandatory in accordance with the Union Ministry of Environment, Forests and Climate Change’s revised solid waste management rules, 2016. The new rules mandate the segregation of garbage into biodegradable waste, dry waste and domestic hazardous waste (which includes diapers, sanitary napkins etc.) before handing it over to conservancy workers. Resident welfare associations and gated communities are expected to ensure that all waste generated within the complex is segregated and also treat biodegradable waste within the premise as far as possible. While the move is certainly a welcome one, the civic body still has no plan in place to make sure citizens adhere to it. The seasonal exchange of inland and seawater dates back to over 2000 years in Pallikaranai. The marshland served as the receptacle for the overflow from 36 waterbodies around it. This has been severely compromised due to mindless fragmentation of the massive wetland. The 220-acre Perungudi landfill which currently receives garbage originating in South Chennai sits right on the Pallikaranai marshland. Mountains of mixed waste choke the crucial wetland ecosystem today. "We're living at a time when wetlands are viewed as wastelands. Why else would the administration construct a landfill on such a biodiverse wetland? Poor understanding of the city's drainage pattern is the root of all evil," laments Jayshree Vencatesan from Care Earth Trust, a Chennai-based NGO working on biodiversity conservation. Along with highrises constructed all over the reclaimed marshland, the dump yard severely restricts the flow of flood waters, resulting in severe waterlogging for days on end around Pallikaranai. Dump yards functioning over and beyond their capacity have been Chennai's reality for years now. Segregating waste at source, composting wet waste and recycling non-biodegradables can unburden these mammoth yards. But is Chennai prepared? What role can citizens’ play? Given that nearly 68 percent of all the waste generated in Chennai is from residences alone, citizens’ role in tackling this menace cannot be ignored. Overall, conceptual awareness does not seem to be so much of an issue as clarity on how to go about segregating household waste. People still remember the corporation's exercise of distributing two coloured bins to encourage households to segregate waste a few years ago. Kanchana, a resident of the southern suburb of Keelkatalai is well aware of the concept but admits that she hands out household waste in plastic bags every morning. When asked why the plastic bag, she says, "How else? Also, I was under the impression that corporation workers do the segregation before they send them to landfills." Her belief, one that is shared by many, is not completely untrue. Conservancy workers sort through the garbage before compactor lorries pick them up from their respective wards. But when mixed waste is secured tightly in polythene bags and dumped, their job becomes all the more difficult. Kumar, a conservancy worker employed by the corporation on a contract basis seconds this. "We have been instructed to separate waste into biodegradable and non-biodegradable and do that to the best of our ability. We make sure to place milk covers, paper and cardboard boxes in separate bins. But when they come mixed with wet waste from the kitchen, it all turns messy and we have a tough time sorting everything," says Kumar. V. Parisutham from Hand in Hand India concurs. "If milk covers and plastic bottles are kept separately from wet waste, workers can segregate them. Imagine a plastic bag filled with wet kitchen waste, the odd milk cover and a sanitary pad, do you think it is possible for the worker to rummage through it and segregate?" Hand in Hand India has been involved in implementing solid waste management initiatives across several town and village panchayats bordering Chennai city. They introduced the concept of waste segregation and door to door garbage collection in village panchayats including Mudichur almost eight years ago. But segregation didn't catch on immediately. "Behaviour change does not happen overnight. We had to engage with the community constantly, talk to them on a regular basis about the need to segregate and put in place a foolproof system to make sure it was followed," says Parisutham. Though Mudichur is considered a suburb of Chennai, it does not fall under the purview of the Greater Chennai Corporation. In neighbouring Perungalathur, a town panchayat, a user fee is collected from residents for managing solid waste. Being classified as a village panchayat, there is no spending provision in existence to meet recurring monthly expenses to manage Mudichur's solid waste. "This was a major challenge for us. But we managed to overcome that by organising locals in the form of self-help groups (SHG) and user contribution was collected from residents through them. Despite that, there is a shortfall; Hand in Hand pitches in to meet it," he adds. SHG members were trained in segregation and waste management. Christened "Green Friends", they were tasked with collecting garbage from doorsteps on a daily basis. The collected waste would then be taken to a resource recovery park where they would sort through the garbage. The biodegradable waste would be separated from the non-biodegradable ones; workers are allowed to sell recyclables and the money raised is usually split between themselves as an incentive. Thanks to local level empowerment and initial handholding, this model has been functioning successfully till date since its inception in 2007. Is metro behaviour different from that of a town panchayat? When asked if people in Chennai would be ready to embrace segregation, the reply is an emphatic yes! "People are the same everywhere. Be it a town panchayat or a metro city segregation is not going to happen just a day after you tell them about it. Micro-level advocacy and consistent follow up is crucial to bring about this behaviour change," says Parisutham. It would be untrue to say that Chennaites do not segregate at all. There are the occasionally concerned citizens and interested resident welfare associations who ensure segregation is done to whatever extent possible. Lakshmi Priya and Sundar, homeowners in upscale Neelankarai are one such. "We make sure to keep plastics bottles, sachets and milk covers separately and hand them over to the conservancy worker every three to four days. The resident welfare association in our area also distributed two coloured bins to encourage segregation. Vegetable and fruit peels get dumped in the shallow pit we've dug for composting in the garden. The amount of wet waste that leaves the house is very minimal," mentions Lakshmi Priya. While this couple has the luxury of space, most people in Chennai have to make do with very little or no open space around their houses. Also, one cannot rely purely on individuals' environmental concerns and interest. Segregation might seem simple to the initiated but people need a little handholding initially to show them what goes where. Along with constant engagement, a proper collection system needs to be put in place too. General apathy aside, one of the main reasons for garbage being dumped along roadsides and in empty plots is the irregular collection. Once segregated, garbage needs to be picked up regularly to minimise snags. For waste segregation to be successful on a large scale, government intervention in terms of training, constant reminders and enabling infrastructure is indispensable. Start small: More often than not, the idea of segregation and the associated jargon make the process seem intimidating. Start small. Make sure to not dump plastic waste along with kitchen waste. One plastic bottle recycled is one bottle less in a mixed waste pile in a landfill. Compost: Kitchen waste can be composted with a very minimum effort at home. If you have a garden at home, just dump vegetable peel around plants in a shallow pit and see them transform into manure in a few weeks’ time. To make the job a little easier, aerated compost bins are available in the market. All you have to do is dump kitchen refuse into it and turn the waste every few days to aerate the pile. It would have transformed into dark brown compost in about three months which can be used directly as manure for plants. Recycle locally: Show the local old paper and scrap iron dealers some love. They are the kings of local recycling and have helped many a bottle and cardboard boxes from dying a very slow and unproductive death in overcrowded dump yards. Some help online: Too tired to head out to the local scrap dealer? Fill up a trash request and get folks from Kuppaithotti to come collect recyclables from your doorstep and get paid for it too. Video: "80% of waste we generate everyday can be recycled"